[dropcap custom_class=”normal”]A[/dropcap]utumn rain always seems to catch me by surprise. Just yesterday I neglected to peek at Weather Underground and scampered off to work in a pair of ballet flats only to find myself dashing through a downpour after work. My car wasn’t far away, but it was still enough time for my shoes to fill with water (and if you think an evening commute is bad, try it with wet, cold feet). That miserable experience offered plenty of motivation to arm myself with an arsenal of rainy day attire that can handle the chilly precipitation, starting with a pair of Joules rain boots. 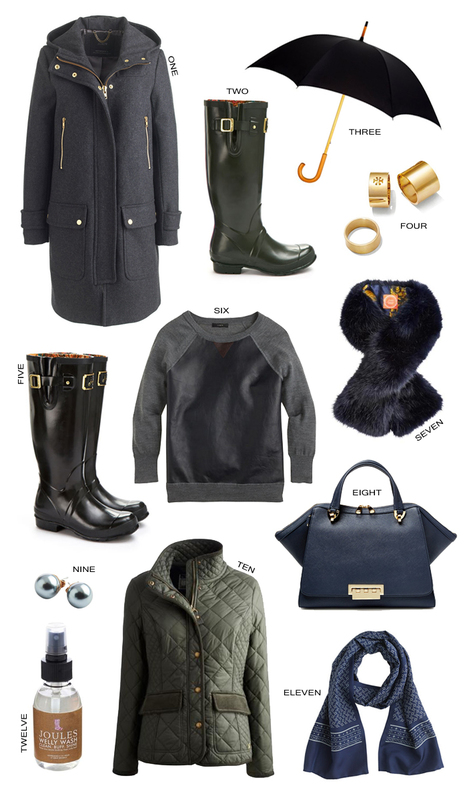 I already own a pair Joules wellies in turquoise, which I adored last winter, but I’d love to add a more subdued pair to my wardrobe in either olive or black. The glossy finish pairs well with classic, sophisticated items. Try a cropped quilted jacket and a menswear-inspired scarf for a casual look or go glam with a faux fur scarf (it also comes in the prettiest emerald green) and a cozy wool coat. Whatever you do, make sure you stick with a saffiano leather purse. The textured finish repels water and keeps the bag looking pristine. This post is sponsored by Joules. Thanks for supporting the brands that support Bedknobs & Baubles!